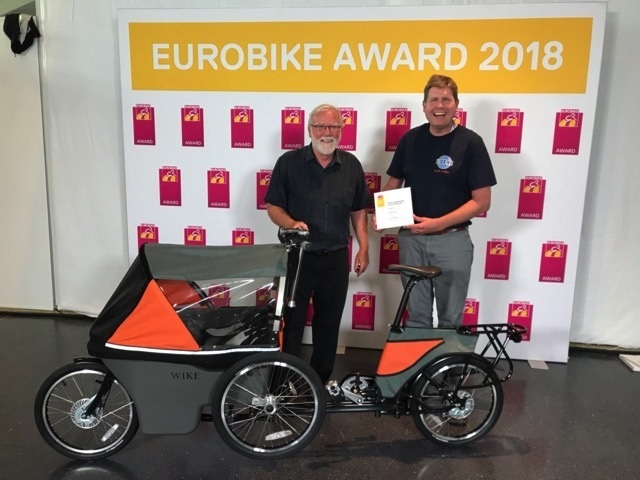 GUELPH, ONTARIO – July 10th, 2018 – Wike, a Guelph company and Dragon’s Den contender, has won a 2018 EUROBIKE Award at the world’s leading bike industry trade show. The Salamander, a convertible cycle stroller, was selected by the EUROBIKE judges among 366 contenders at the 27th EUROBIKE trade show in Friedrichshafen, Germany. The EUROBIKE Award highlights functionality, innovation, sustainability and workmanship in the bicycle industry. Wike launched the Salamander in 2017 after five years of research and development. The patented cycle stroller operates both as a standard Dutch-style cargo bicycle and a double child-stroller. The design allows parents to cycle with their children safely and easily switch from bike-to-stroller to enter stores or board public transit. Wike’s Salamander is the latest in a long line of bicycle products, but it is the first to receive recognition from an international organization like EUROBIKE.